Despite how well pandas works, at some point in your data analysis processes, you will likely need to explicitly convert data from one type to another. 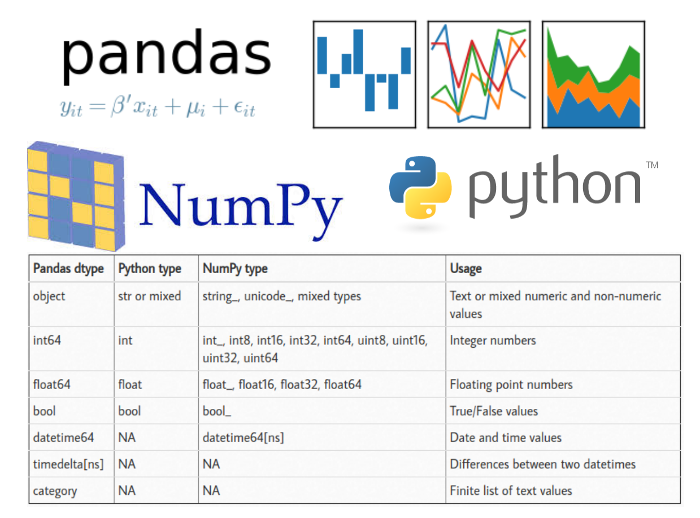 This article will discuss the basic pandas data types (aka dtypes ), how they map to python and numpy data types and the options for converting from one pandas type to another. For the most part, there is no need to worry about determining if you should try to explicitly force the pandas type to a corresponding to NumPy type. Most of the time, using pandas default int64 and float64 types will work. The only reason I included in this table is that sometimes you may see the numpy types pop up on-line or in your own analysis. The category and timedelta types are better served in an article of their own if there is interest. However, the basic approaches outlined in this article apply to these types as well. Data types are one of those things that you don’t tend to care about until you get an error or some unexpected results. It is also one of the first things you should check once you load a new data into pandas for further analysis. I will use a very simple CSV file to illustrate a couple of common errors you might see in pandas if the data type is not correct. Additionally, an example notebook is up on github. This does not look right. We would like to get totals added together but pandas is just concatenating the two values together to create one long string. A clue to the problem is the line that says dtype: object. An object is a string in pandas so it performs a string operation instead of a mathematical one. Additionally, the df.info() function shows even more useful info. Until we clean up these data types, it is going to be very difficult to do much additional analysis on this data. In order to actually change the customer number in the original dataframe, make sure to assign it back since the astype() functions returns a copy. Both of these return ValueError exceptions which mean that the conversions did not work. In each of the cases, the data included values that could not be interpreted as numbers. In the sales columns, the data includes a currency symbol as well as a comma in each value. In the Jan Units columnm the last value is “Closed” which is not a number; so we get the exception. So far it’s not looking so good for astype() as a tool. We should give it one more try on the Active column. At first glance, this looks ok but upon closer inspection, there is a big problem. All values were interpreted as True but the last customer has an Active flag of N so this does not seem right. If the data has non-numeric characters or is not homogeneous, then astype() will not be a good choice for type conversion. You will need to do additional transforms for the type change to work correctly. Since this data is a little more complex to convert, we can build a custom function that we apply to each value and convert to the appropriate data type. The code uses python’s string functions to strip out the ‘$” and ‘,’ and then convert the value to a floating point number. In this specific case, we could convert the values to integers as well but I’m choosing to use floating point in this case. I also suspect that someone will recommend that we use a Decimal type for currency. This is not a native data type in pandas so I am purposely sticking with the float approach. Also of note, is that the function converts the number to a python float but pandas internally converts it to a float64. As mentioned earlier, I recommend that you allow pandas to convert to specific size float or int as it determines appropriate. There is no need for you to try to downcast to a smaller or upcast to a larger byte size unless you really know why you need to do it. Now, we can use the pandas apply function to apply this to all the values in the 2016 column. Success! All the values are showing as float64 so we can do all the math functions we need to. If you are just learning python/pandas or if someone new to python is going to be maintaining code, I think the longer function is more readable. The primary reason is that it includes comments and can be broken down into a couple of steps. lambda functions are a little more difficult for the new user to grasp. Secondly, if you are going to be using this function on multiple columns, I prefer not to duplicate the long lambda function. Finally, using a function makes it easy to clean up the data when using read_csv(). I will cover usage at the end of the article. Some may also argue that other lambda-based approaches have performance improvements over the custom function. That may be true but for the purposes of teaching new users, I think the function approach is preferrable. Here’s a full example of converting the data in both sales columns using the convert_currency function. For another example of using lambda vs. a function, we can look at the process for fixing the Percent Growth column. The final custom function I will cover is using np.where() to convert the active column to a boolean. There are several possible ways to solve this specific problem. The np.where() approach is useful for many types of problems so I’m choosing to include it here. The dtype is appropriately set to bool . Whether you choose to use a lambda function, create a more standard python function or use another approach like np.where() , these approaches are very flexible and can be customized for your own unique data needs. Pandas has a middle ground between the blunt astype() function and the more complex custom functions. These helper functions can be very useful for certain data type conversions. If you have been following along, you’ll notice that I have not done anything with the date columns or the Jan Units column. Both of these can be converted simply using built in pandas functions such as pd.to_numeric() and pd.to_datetime() . The final conversion I will cover is converting the separate month, day and year columns into a datetime . The pandas pd.to_datetime() function is quite configurable but also pretty smart by default. In this case, the function combines the columns into a new series of the appropriate datateime64 dtype. The dataframe is ready for analysis! The basic concepts of using astype() and custom functions can be included very early in the data intake process. If you have a data file that you intend to process repeatedly and it always comes in the same format, you can define the dtype and converters to be applied when reading the data. It is helpful to think of dtype as performing astype() on the data. The converters arguments allow you to apply functions to the various input columns similar to the approaches outlined above. It is important to note that you can only apply a dtype or a converter function to a specified column once using this approach. If you try to apply both to the same column, then the dtype will be skipped. As mentioned earlier, I chose to include a lambda example as well as the function example for converting data. The only function that can not be applied here is the conversion of the Month , Day and Year columns to the corresponding datetime column. Still, this is a powerful convention that can help improve your data processing pipeline. One of the first steps when exploring a new data set is making sure the data types are set correctly. Pandas makes reasonable inferences most of the time but there are enough subtleties in data sets that it is important to know how to use the various data conversion options available in pandas. If you have any other tips you have used or if there is interest in exploring the category data type, feel free to comment below. 7-Jan-2019 : The Category article is now live.